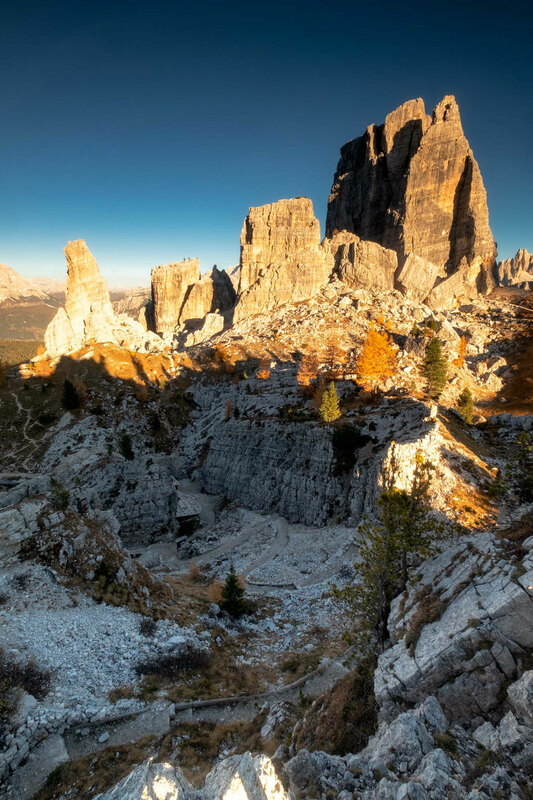 If you find yourself in the close vicinity to Cortina D'Ampezzo when travelling through the Italian Dolomites, then consider visiting Cinque Torri. Cinque Torri simply means five towers. Thanks to their interesting geological features they belong on the list of my favourite photography spots in this part of the Alps. There is a chairlift running directly to Cinque Torri, but I am here to encourage you to explore the area on foot, because easy targets don't bring satisfaction, am I right? You are travelling through the mountains for a reason, so make sure to take advantage and spend as much time outside as possible! There are many routes up to Cinque Torri, and quite frankly, they are all very similar in terms of length and grade. 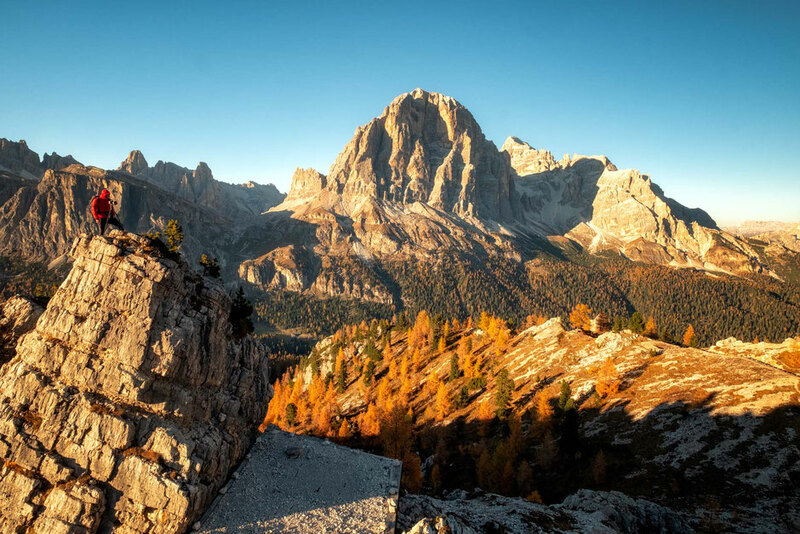 The easiest (not by much) is the route directly underneath the Cinque Torri chairlift which starts at Baita Bai de Dones just 25 minutes outside Cortina driving toward Passo Falzarego. A slightly longer option, but with less elevation gain, would be to hike from the famous mountain pass - Passo Giau. I cover this route in my post about via ferrata Averau. The third option, which I recommend taking is to start at rifugio Gallina, near passo Falzarego, along path nr 440. There’s an ample parking close to the refuge right along the road. On the opposite side you can find a small restaurant "Da Strobel". If you have extra time you can do a slight detour to the beautiful Lago di Limides adding roughly 45 minutes to your trek. From Rifugio Gallina the path meanders along the Rio Falzarego but not before long breaks away from the stream and starts to ascend. The views become more frequent as you approach the tree line. 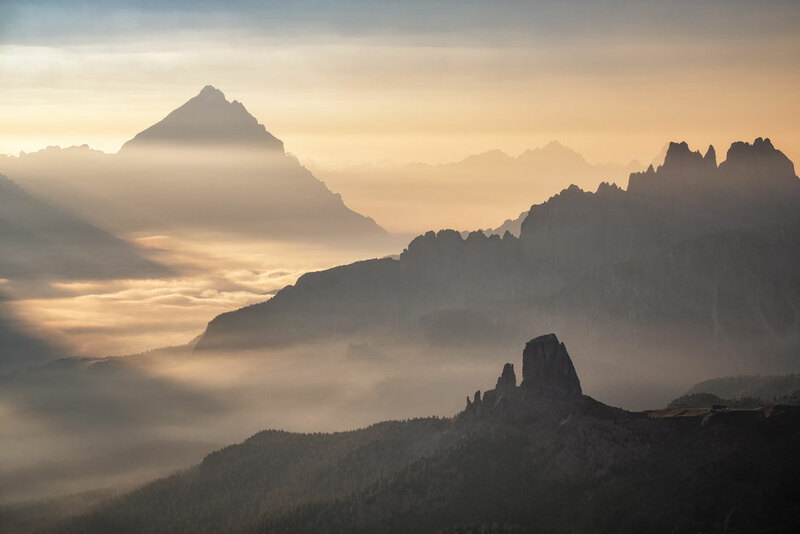 Your target, which you’ll be able to see from quite a distance away, is rifugio Scoiatolli, a beautiful mountain hut situated only a couple hundred metres away from the Cinque Torri. The route is well marked and encompasses only 200m of elevation gain. Once you’re at the refuge, which should take around an hour, you’ll see numerous paths leaving in all directions toward Cinque Torri. Pick one and start exploring. 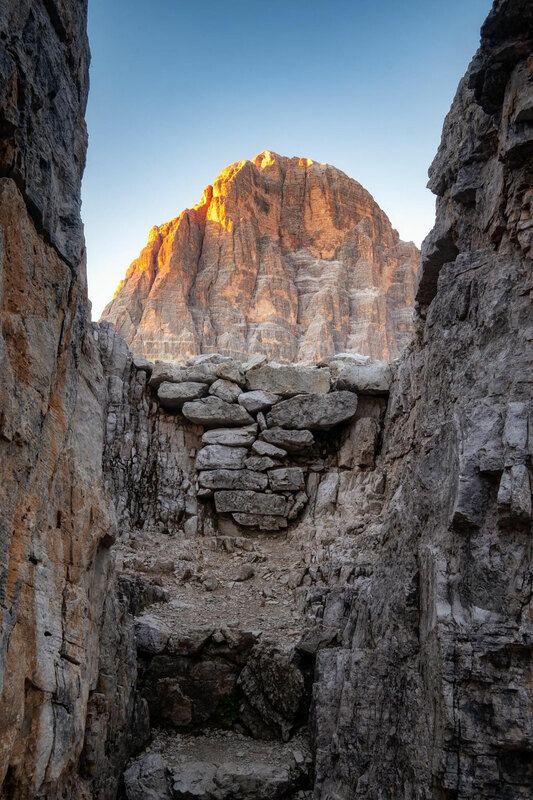 The whole area was used extensively, just like the tunnels on Monte Lagazuoi, during the first world war and many trenches and dugouts still remain in the area. There’s a multitude of main pathways and scattered desire lines which lead all around Cinque Torri, right up to their faces, and around the eastern side of these 5 great monoliths. Climbers can often be seen at their summits or clinging precariously to their walls. You can easily spend an hour exploring and then another hour taking in the views whilst lounging on one of the many deck chairs that belong to Rifugio Scoiatolli. 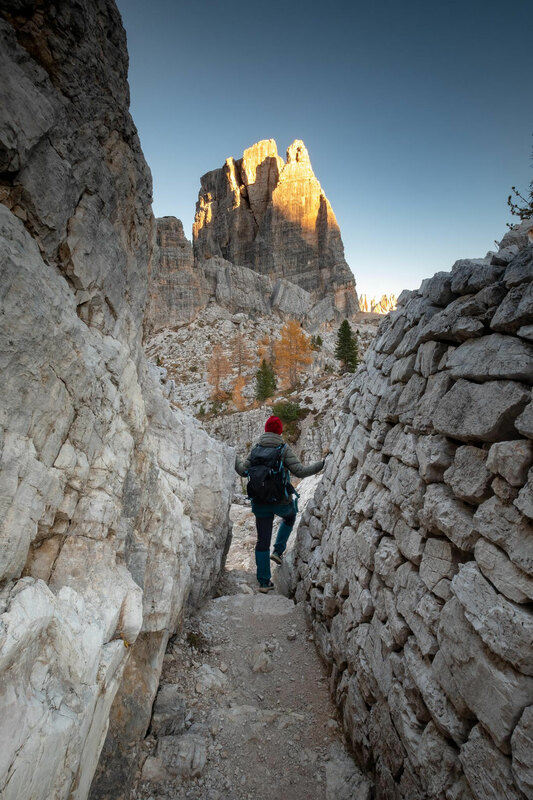 This short hike, part of much longer 118 km Alta Via 1, is a great introduction to the fascinating history of the Italian Dolomites. Admittedly this is a short hike. 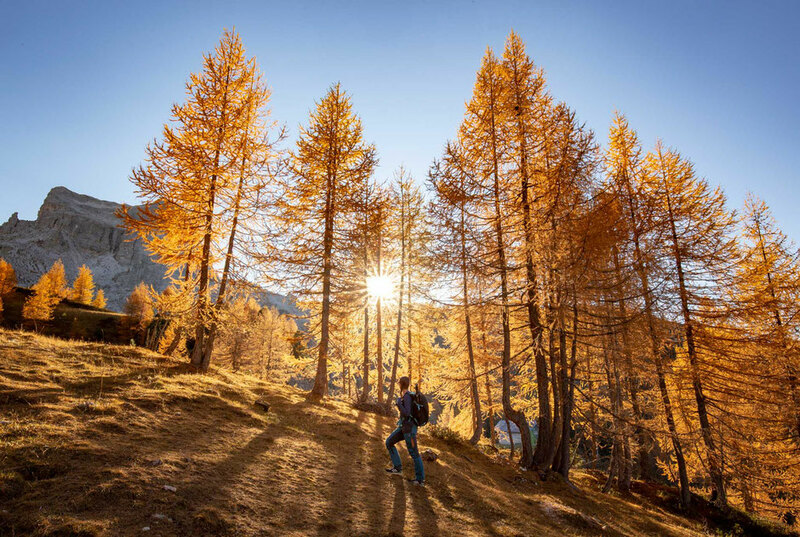 To turn it into a full day excursion you can extend it by hiking further to rifugio Averau, 45 minutes away on an uphill path nr 439. This will add 150m of ascent to your day. Still not satisfied? 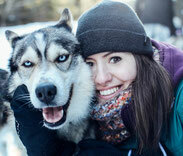 You can go even further to rifugio Nuvolau along path nr 438. Nuvolau is one of the most photogenic mountain huts in the Dolomites and the views from its deck are unreal! This adds another 30 minutes and 170m of elevation from rifugio Averau. Both huts are visible from Cinque Torri. If you’re a keen adventurer like me, and looking for challenge you could also consider combining this hike with a scramble to the summit of Mount Averau, but you will need to bring your via ferrata equipment along and plan accordingly. Is there something I forgot to cover? 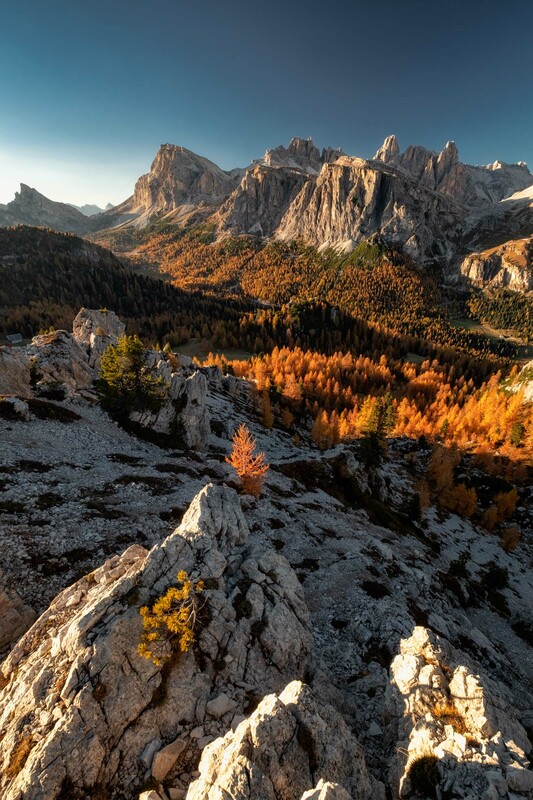 If you would like to know more about this or any other hike in the Dolomites, post your questions in the comments!